State Rep. Andy Holt (R-Dresden) said his constituents "are sick and tired of being constantly watched by street cameras hoping to make a quick dollar off of them." Rep. Holt took to social media to ask voters in his district whether or not they were in favor of highly controversial speed and red light cameras. 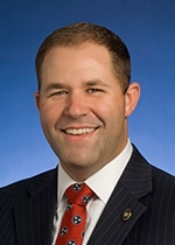 "If I could single-handedly outlaw every speed camera in the great state of Tennessee, I would do it without a second thought," said Rep. Holt. "Regardless of political party, the vast majority of folks are 100 percent against them." Rep. Holt said he received hundreds of messages from Democrats and Republicans supporting his call to outlaw the controversial cameras that he said have been ruled unconstitutional in many states. He stated, "Speed & red-light cameras are nothing more than a modernized form of speed-trapping. They have very little to do with safety, and everything to do with municipal greed. Apart from being a technically unlawful form of local fundraising off the backs of local citizens, it's a poorly contracted scheme since a large portion of the "revenue" is sent elsewhere, outside the state of Tennessee." Rep. Holt said that many businesses in his district are concerned due to the fact that motorists are now avoiding streets where the cameras are located, which he said is hurting their bottom line. He said, "In a depressed economic environment, I believe we should all be aware that money walks. This goes for all policy makers; federal, state and local. When people and businesses are over-regulated, they leave. I support these movements if necessary; that's the basis of liberty and freedom as our founders intended, and Tennessee is currently a beneficiary of these movements from other states. We need to ensure that our state does not begin moving in the wrong direction by allowing folks' rights to be violated so out-of-state businesses can collect revenue." He said that some are upset and have accused him of being soft on crime. He said, "Some have argued against the calls to outlaw speed traps and red light cameras by saying that I am being "soft on crime." Let me be clear... I believe in the rule of law. Therefore, due process of the law. How can one ever claim to believe in the rule of law, set forth by our Constitution, if they willingly allow the rights of millions of Tennesseans to be violated by these cameras and traps? On Tuesday, I swore an oath to protect the Constitution of Tennessee and the United States of America, and that is exactly what I plan to do." Rep. Holt said he is planning to introduce a bill within the coming weeks.